Call/text (608) 262-5000 for a walk! 10/1 - 3/31: 7 p.m. to 1 a.m.
4/1 - 9/30: 8 p.m. to 1 a.m.
To request/schedule a SAFEwalk, call or text (608) 262-5000. Set up a SAFEwalk for after class/work! Late night class or studying? Working late and need to get home? To request a SAFEwalk, call or text (608) 262-5000. To request a SAFEwalk, call or text (608) 262-5000. 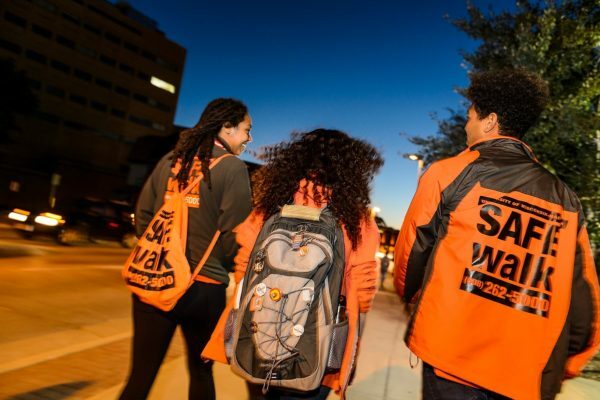 SAFEwalkers can accompany you throughout campus and near-campus locations! (Service boundaries do not include far west campus, such as UW Hospital and Eagle Heights.) 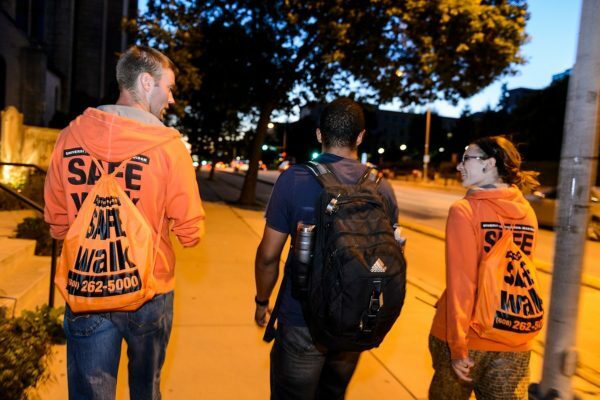 SAFEwalk is a free walking companionship service available to all students, faculty, staff, and UW visitors. Respond to requests for walks. Watch for suspicious situations around campus. All SAFEwalkers undergo training with UW Police and are able to assist in a variety of situations. Each team carries a two-way radio and is able to act as a mobile emergency phone between UW Police and SAFEwalk dispatchers. Call or text (608) 262-5000. Give your first name to the dispatcher. Depending upon your location and destination, the dispatcher will determine whether you are eligible for SAFEwalk services. Tell the dispatcher the phone number you are calling from and be available to answer calls in case the walkers have trouble finding you. Dispatcher will send a SAFEwalk team to your location. Be accessible. Stay by a phone. The SAFE dispatcher may need to call you if there is a problem or delay. SAFEwalk services are not available on legal holidays when Transportation Services is closed. These days include New Year’s Day, Martin Luther King, Jr. Day, Memorial Day, Independence Day, Labor Day, Thanksgiving, Christmas Eve, Christmas Day, New Year’s Eve. Please note: if a legal holiday falls on a Sunday, the state observes it on the following Monday. 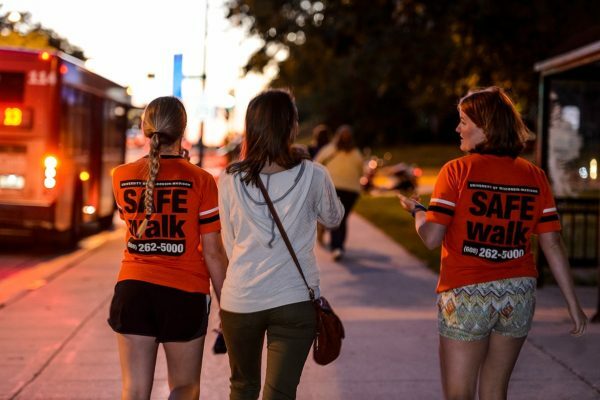 SAFEwalk staff can make presentations about safe campus travel. If you are interested in scheduling a presentation, contact the SAFEwalk coordinator at (608) 262-9798. Please refer to the UW-Madison Police Department website for safety tips and recommendations. UWPD has launched the WiscGuardian app, which turns your smartphone into a personal safety device. Features include a safety timer, and immediate access to UWPD emergency and non-emergency lines. Plan ahead. Do not wait until the last minute to consider your personal safety and your nighttime travel plans. Stay away from poorly lit areas and avoid taking shortcuts down dark alleyways or paths; be aware of places along your path that could conceal a criminal . Choose well-lit, heavily traveled sidewalks. Whenever possible, do not walk alone at night. Always be aware of your surroundings; using headphones or talking on a cellphone can reduce your awareness. If you see something suspicious in the direction you are heading, change your route. Keep your head up. Do not look down or away—make brief eye contact with people you meet. If someone is following you, make your way to a populated area. Carry yourself with confidence. If confronted, shout or use a whistle to attract attention. Trust your instincts. If you feel something isn’t quite right, don’t take chances. Change your plans or call for help. Make sure to tell someone your plans, your travel routes and when to expect your arrival. Wear clothing that will allow you to run if necessary. If you need to run, drop your valuables (heavy books, packages, etc.) since these slow you down. The UW Campus Lightway is a network of well-lighted sidewalks and paths for pedestrians. Lightway routes are marked with reflective, yellow Lightway signs affixed to light poles. Be sure to observe nighttime safety practices when using the Lightway paths! The paths are marked on the SAFEwalk Service Boundaries and Lightway Path Map (PDF). If you are out at night and need to locate a safe place, you can walk into the foyers of one of the University Residence Halls. Check the bus page for night bus route and schedule information. Routine nighttime paratransit rides (to and from evening classes, trips to the library, etc.) should be arranged through Madison Metro. Interested parties should check with Metro for eligibility requirements. Application forms for this service are available at campus residence halls, the McBurney Disability Resource Center (links opens in a new window) or by calling Metro Transit at (608) 266-4466 or TTY (608) 267-1143. Many campus lots may have evening parking availability. Please check the lot locations and hours page for details. Park in well-lighted locations and do not walk alone after dark. Plan in advance where you will park and walk. Contact SAFEwalk for company on your walk! You can also use the WiscGuardian app from UWPD.